Tonight my developmental English class at Community College of Philadelphia got me a thank you cake. I am proud--of the class, of my abilities, of the way we worked together to meet the goals of the course. I don't think I could ask for anything more from a class. 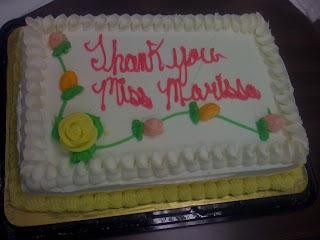 I don't want to make too much of it, but I think this sweet sweet cake made my year.